They’re superheroes who have retired to the suburbs. Sure, Pop’s gone to seed a bit and Mom may be a bit wider in the hips, but they’ve still got it where it counts—plus, now they have a couple of superpower-endowed kids. And they may just be the only ones who can save the world. After all, they’re the Incredibles. 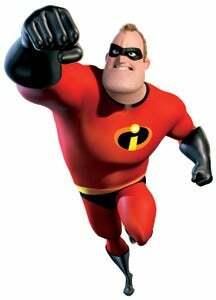 Game developer THQ has brought the big-screen adventure of Pixar’s blockbuster The Incredibles to an action-filled new game by the same name. Even more incredible, the game arrives on Windows and the Mac simultaneously—a truly rare occurrence. Rated for teens, the game is best described as a third-person action brawler. You control one of the Incredibles and make use of his or her superpowers to battle baddies on screen. Mr. Incredible is incredibly strong, and Mrs. Incredible can stretch like elastic. Violet, their daughter, can turn invisible and cast a protective shield, and their son, Dash, has the power of speed. The game begins with a prologue in which the future Mr. and Mrs. Incredible team up as young, single superheroes to defeat Bomb Voyage, a French pyromaniac who is attempting a bank heist with a gaggle of chatty mime henchmen. Eventually, the entire family travels to the island of Nomanisan to do battle with Syndrome, a treacherous costumed supervillain with plans to take over the world. Through 18 levels, you’ll take turns playing as each Incredible, as you make your way through Syndrome’s base and fight legions of henchmen and countless other bad guys. The game eventually builds to an epic final confrontation. Controlling your character is fairly easy. A set of straightforward key commands lets you make use of each character’s special abilities; you use the mouse to change the camera perspective. The Incredibles retains some of the film’s music and voice acting, so you’ll have a real movie experience as you’re playing. THQ still needs some practice in making Mac-like games. For example, The Incredibles doesn’t run in windowed mode, so it won’t look as good on LCDs that must scale the game’s non-native resolution. Another annoyance: the game demands that you install a “Play” disc, but neither of the two included discs are labeled as such. The Incredibles’ genesis as a console game is also readily apparent. Although the game has an autosave feature, it kicks in only after you’ve completed a level—a real drag if you have only five or ten minutes to play. It also limits you to three save slots. The game’s system requirements aren’t extraordinarily high: all you need is an 867MHz or faster Mac with a GeForce2 MX card. But you’ll have a much better experience with a more powerful graphics chip or a faster processor. The game doesn’t offer many options for fine-tuning the graphics settings to improve performance; however, you can turn on full-scene antialiasing (FSAA) if your card supports it. The Bottom Line THQ deserves kudos for making the effort to release The Incredibles on the Mac and on the PC simultaneously. Limited save and graphics features mar the experience a bit, but the game offers plenty of fun for fans of the movie. Taking care of bad guys is all part of a day's work for members of the Incredible family.